Most of the marketing professionals perceive the analytics dashboard as a dark, confusing place. The Lord of Internet knows that I’ve felt the same way until recently! Fortunately, Amplifr crew succeeded in transferring the fascination for complex data to me. Now, it’s time for you to experience a new, rather enjoyable side of social media analytics yourself! Why would anyone ride a bike with their eyes covered? Would you taste a meal made by the chef who doesn’t read the labels? The sour reality is: one must know the data, in order to successfully arrive from point A to the point B. In this case, anyone who wants to grow a business with the help of social media, should definitely know the ins and outs of analytics. Not all social media platforms are created the same and also, not all of them offer comprehensive analytics. From all the platforms we covered in this amazing guide of ours (and you’re amazing for getting to Chapter Six, wow!) just three of them have deep analytics dashboards. On our quest for the best social media practices, we learned about Facebook, Twitter, Instagram, Pinterest and Tumblr, from which Facebook, Twitter and Pinterest proudly present downreaching internal data insights. Instagram and Tumblr do offer analytics too, but a more basic version of data presentation. Who can benefit the most from using the analytics tools for social media? You. The chances are big that you can immensely benefit from navigating through analytics. In all seriousness, anyone who uses social media to grow their online presence, or as a part of the sales funnel, should tackle the mysteries of analytics. Starting from marketers, to solopreneurs, social media influencers, small business owners, media and PR agencies, up to large companies and firms. If you belong in any of these (or similar) professional profiles, know that the wisest way to elevate a social media strategy is to dive into its data. The truth is: many of your competitors, regardless of the industry, will still ride a bike blindfolded or prepare dishes without reading the labels, meaning – manage their social media channels while ignoring the numbers behind them! To dodge a bullet of ignorance, read throughout our free guide and learn how to use social analytics to your advantage. What is social media analytics, exactly? Examining the data from managed social media networks. In essence, the process involves a discovery and the professional interpretation of usually rich information. Furthermore, a meaningful grouping of available information also falls into the realm of analytics. Finally, an understanding of patterns which emerge out of the collected information is what makes the process of analytics truly useful for a business. All these steps can be done with a little help of analytics tools. The programs (tools) used for different monitoring and analytical purposes vary in their features and capacities. Many are in-built into the social platforms themselves, but seldom do these offer the comprehensive features found in dedicated analytics tools. Simply, the in-built versions often cover only the basic metrics, while tools such as Amplifr provide deeper insights (in this case, focused on game-changing metrics that encourage monetization). One of the most common uses of social media analytics is to support and improve on social marketing efforts. At the beginning, in order to avoid the overwhelm of data, it is desirable to accurately determine your business goals. It is helpful to do this before even opening the analytic dashboard. This wise step will clearly focus your attention and time to metrics that matter. Raising awareness on topics your company believes in. The next step, after you’ve set your social media marketing objectives, is to define your KPIs (key performance indicators). Once you’ve set the KPIs, it will be possible to objectively and effectively use the gathered data. Moving on, not all metrics are KPIs. What does that mean? KPIs represent the metrics which are not only useful, but crucial to the campaign success. Once the data is filtered and KPIs have emerged, a proper attention can be devoted to processes and tasks which lead to most progress. As an example, if your goal is more sales through social channels, then conversions certainly play a bigger role than the likes. Therefore, conversion stats should be in the spotlight of your analytics. At the beginning, diving into the numbers behind your social activity might feel as entering a deep, dark cave full of vicious, bloodthirsty monsters. Though it does require a bit of time and quite an effort, getting started with social media analytics is not so difficult as commonly believed. In simplest of words, social media analytics has two main phases – gathering/collecting of data, and the interpretation of that data. The interpretation itself consists of first grouping and then, understanding of patterns. What tools are we using for each and every of these steps? Correct, the social media analytics tools, often built right into the social platforms themselves. Is it better to use the separate, dedicated programs as analytics tools? The answer is a resounding yes! We’ll tell you more about those tools in a bit. Next, before even opening your analytics dashboard, it is necessary to clearly set your business goals and then, define the KPIs which will lead to fulfilling those goals. KPIs actually represent selected metrics which are crucial for success. They can be connected to your social media reach, engagement, leads, or what every marketer fantasizes about – conversions. The foundation is set, more insights on analytics ahead! Still a social media giant, still a leader in the realm of online presence – Facebook is an inevitable station on any company’s digital journey to success. With the help of social media monitoring and analytics, businesses of any size and niche can gain insights into their Facebook audience and the level of their engagement. Beginning from the exact number of followers, over the amount of likes and shares, all the way to conversions, only through analytics you’ll be able to objectively perceive how your Facebook presence is evolving. Because of Facebook’s complex and dynamic nature, marketing efforts on this platform might turn into chaos in a blink of an eye. Imagine handling several pages at the same time, while trying your best to keep track of everything and make the algorithm happy. That is the reality of most Facebook marketing enthusiasts and the reason behind many failures as well. It will be easier for you to plan your future content, after you’ve examined the data from Insights (a vital step for every business). Altogether, Facebook Insights are a vital tool for any professional searching for deeper understanding of social media marketing. 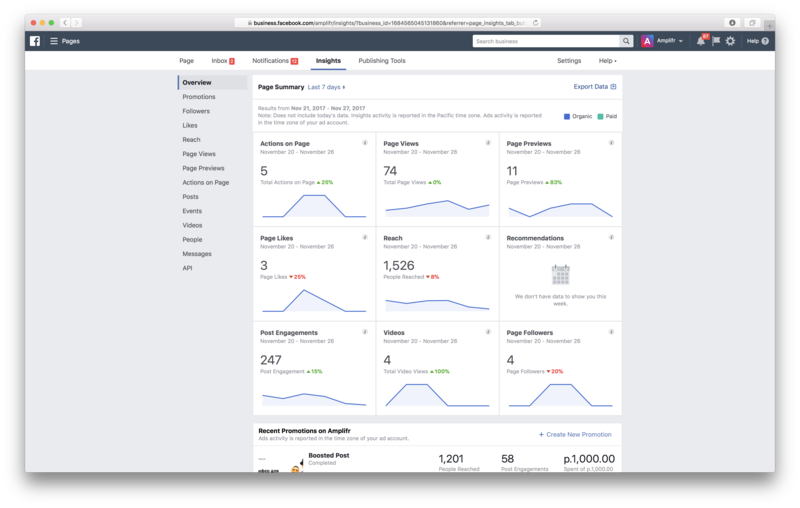 When you enter Facebook Insights, you’ll find a variety of metrics to observe. On a positive side, the layout and an overall presentation of data is rather simple. It is easy to navigate through Insights, but the downside is the lack of certain metrics you could find in tools such as our own. Showing the time of the week when it could be good to post new content. The number of users who were talking about your Facebook content. Also, if you have a Facebook group linked to your page, the group-related data will also show in the Insights. How neat is that! There, you can monitor a couple of metrics, such as your member count (and growth), and basic engagement – comments and overall reactions to your posts. Once you’ve shaken hands with the Dashboard and made yourself acquainted with its main data, it is time to move on with the analytics. First, you’ll want to identify the most successful posts. When that part is done, take time to further analyze them. There are many benefits of data-based knowledge, as it pushes your content strategy in the right direction. Likewise, a marketing professional who knows the numbers can wisely strategize the reposting and boosting actions. Posting times – when was this content posted? At what time and in which part of the week? Was it posted after a longer break? Post format – maybe the majority of high-performing posts are in the form of a video? Or perhaps a link, an image or pure text? Different formats might bring the best out of your content, so make sure you’re fully leveraging their power. Content tone of voice and messaging – have you noticed the pattern in here as well? Does your audience prefer a little bit of humor or purely informational posts? These and similar questions will surely help you re-think on your marketing strategy, so you could achieve better business results on Facebook. It happened a couple of times: an enthusiastic marketing novice opens up the Facebook Insights Dashboard. Inside, the plethora of interesting numbers are waiting to be read and evaluated. What happens next? This beginner of ours spends hours, maybe even days, diligently going through each and every statistic. After all, that is the point of analytics, to analyze all the data, right? The truth is – while some of the data can provide valuable insights, certain metrics most probably won’t impact your business growth in any way. Here, we come back to our dear KPIs. As you know, key performance indicators or KPIs are simply the game-changing parts of data. Rest assured you’re focusing your efforts on those relevant numbers during the analytics process! For an example, in certain cases you’ll throw the attention on quantity and in others, on the quality or a story behind the data. As far as conversions are a burning topic, you’ll look at the quantity (the number of sales). Otherwise, for likes, you might look deeper than the mere amount and analyze the demographics behind those likes. Analytics is a dark and hostile place, until you realize the simplest of truths: as long as you’re thinking strategically, while focusing on KPIs, analytics becomes your ally in the game of social media marketing. Whenever you find yourself digging through numbers for numbers sake, take a moment to reflect and come back to your business and growth goals. Start from defining where you want to go in the strategy and then, use the data to improve and eventually, get there. Track the conversions and actual sales made with a help of your Facebook content – try finding the ways to make your customer’s journey even easier. Sign up to Amplifr and connect your Facebook Page for convenient content management. Well done, we’ve covered a lot in here and more observations on social media analytics are coming your way! In essence, no matter what platform’s data you’ll be analyzing, always give your best to grasp the patterns and certainly, put your understanding into practice by improving on the strategy itself. According to the mind-blowing statistics, over 350.000 tweets are sent every minute! Therefore, it is easy to get lost on Twitter, while trying to keep up with such a rhythm and grow an audience on this hectic social media platform. On Twitter, analytics come to the rescue – it is of vital importance to determine which tweets are performing well. Without a solid content strategy, based on data-proven successes, Twitter marketing efforts might turn into a pointless flood of information. Which is truly a pity, because we all know how profitable Twitter can be as a part of the sales funnel. Not many social media platforms have built-in analytics, so take your learning vitamins (or a bite of dark chocolate, it does wonders for concentration) and let’s expose how Twitter Analytics work and what could this feature do for your business. Twitter has its own Analytics Dashboard, enabling you to check some basic metrics and observe how your profile is performing “behind the scenes”. Surely, independent analytic tools such as the one in Amplifr, provide deeper, more conversion-focused insights. One thing is certain, Twitter Analytics could serve as a convenient starting point. What is the reach of your tweets? How many followers interact with your content? Who are those people – their age, gender, location, etc.? When does the biggest part of engagement happen? What kind of content is the most popular one? How many people clicked on your links and did their journey end positively (either with a purchase or a sign-up)? But, the same principle applies to Twitter, as it does to Facebook (and any other social media channel): always begin with your own business goals, before you even step into the analytics part. Be detailed and specific in your company’s goal-setting. The clearer your vision is, the easier the analytics will be! Every social media website is unique. Each and every one has certain features which should be tracked with particular attention. Whether you’re a marketer, a business owner, an agency professional, a blogger or someone wanting to further grow an already large company, there is a type of Twitter data you should focus on. Mold your strategy according to your wins – your top tweet (either with an image, video or a link) is also visible in Twitter Analytics. Alright, it’s time to separate the wheat from the chaff, which means nothing to you unless you’re a farmer (if you’re a social media pro and a farmer, we’d love to meet you). Simply said, the time has come to distinguish the valuable metrics from rather worthless ones. When it comes to Twitter specifically, the number of link clicks usually matters the most. Twitter has been proven to be an excellent part of a sales funnel, so our wild guess is that you’ll use its potential as well. If you do, make sure to track the number of clicks on the links you’ve posted, leading to any kind of offers (various CTAs, sales pages, promotions and similar). Video completion – showing how many people watched your videos all the way to end. First, we’ll grab a moment to say “thank you, Twitter, for making useful analytics a part of your platform”. It is certainly a rarity that social media website itself, particularly a microblogging one such as Twitter, offers free analytics. As someone who wants to grow a business on Twitter, you can, without any doubt, use this opportunity to better understand your followers and their activity on your profile. 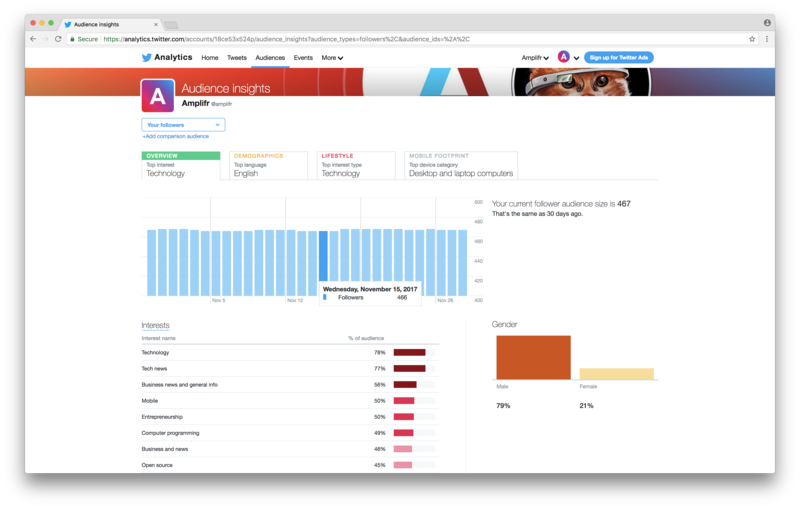 Sign up to Amplifr and connect Twitter accounts for content performance insights. Discover the metrics for all of your tweets, knowing that no marketing strategy is set in stone (especially not for social media!) and by learning, observing and improving, you should enjoy the benefits of Twitter growth in its full glory! What could be so difficult in Pinterest marketing? Simply pin the content you like, post the content people will pin and there you go! Much more than once, we encountered such a reaction to Pinterest. But, the experience teaches: when a social media platform looks too simple to be true, it often means that growing a business on it will be hellishly difficult. True, it is easy to be present on Pinterest. But, try growing an engaged audience in there. Even worse, do so while avoiding to “look at the numbers”. Honestly, the only consequence of this laidback approach would be a painful waste of time and resources. Needless to say, any social media marketing strategy becomes easier with smart analytics. Pinterest, as intuitive as always, provides its own analytics for you to use, freely. So, do not miss out on the chance to evaluate and improve your pinning. Remember – every little thing you learn about social media analytics places you (at least) one step ahead of your competitors. With that said, let’s see what Pinterest Analytics has to offer for you and your business account. Do you know which pins people like the most? How many users have saved the pins from your website? What kind of content resonates with your audience? To see what content has been pinned from your site, use this link. Even if you’re paying close attention to your profile’s performance, it could be deceiving to merely observe the activity without the help of Analytics. After all, that’s why statistics exist, to show us the true, objective side of things. As a (social media) marketing professional who holds all data in the pocket, you’ll be able to refine the strategy and gain more clicks, impressions, saves and finally, sales through Pinterest. For a beginning, you could define your target audience as clearly as possible. It is recommended to complete this step before the actual analyzing of data. Another step worth mentioning is setting your business goals in detail as well. Now when you know who exactly your target audience is, then head on to Pinterest Analytics recognize those demographics in there. Does these two groups differ? If that is the case, consider restructuring the content strategy, so it targets your ideal customers more directly. Another action you could undertake, armed with the knowledge about your audience, is to see where those future customers are located. Next, observe your posting times and if needed, fine-tune the schedule. Your goal here should be to post the content when the majority of your brand’s fans are online. Oh yes, we almost forgot about top performing Pins! This section of Pinterest Analytics is particularly interesting, as it goes beyond impressions and also, shows the repins and which posts inspired the most clicks. In there, you can see 50 top performing content pieces. Our advice is to focus on high-clicked Pins, because those are the ones which lead to action – people learning more about your business, making a purchase, subscribing, etc. 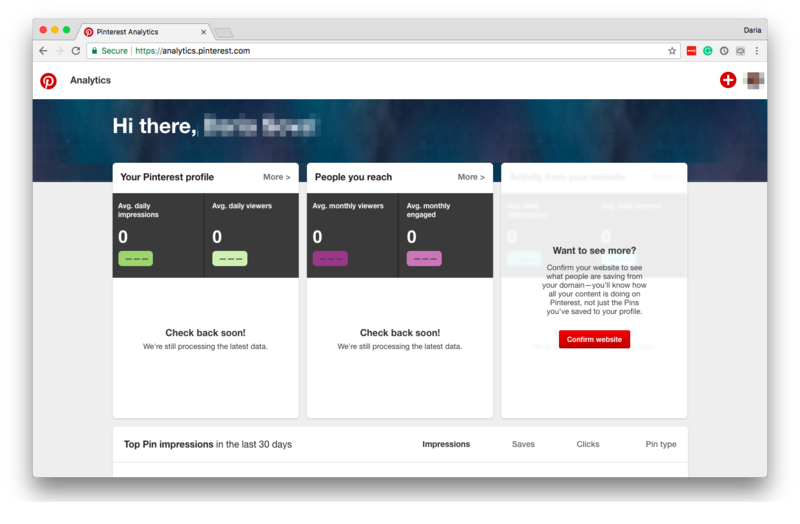 The next part of the Pinterest Analytics we will explore is aimed at Boards. Just to refresh your memory, Boards act as albums, collecting various Pins under the particular topic or interest. In the Analytics Dashboard, you’re free to dive into data showing which Boards contain a lot of Pins connected to your business website. Keep in mind that this part contains information both about the Boards you’ve created and the ones other people made. What can you do with this kind of data? Similar to high-performing Pins, use these insights to learn what content, topic or products draw the most attention. Then, create more Pins and organize them in Boards which follow those successful patterns. Follow these steps diligently and make sure you’re constantly referring to the data inside Analytics to stay on track. You are surely familiar with the types of Pins you could use. That is correct, it is possible to pin either someone else’s or your own content. We’re glad you know this, but are you aware that both of these approaches should be used in a Pinterest strategy? The same principle stands here, as anywhere in the world of social media. Please, do not be a “me, me, and only me” kind of brand, but honor other people’s content, while presenting your own at the same time. A proper balance is the key, as always. So, the additional metric you’ll want to check is how many original Pins are created from your website (daily). Furthermore, take a look and analyze the recent unique Pins. Why, oh why would you do this? What are the latest trends and how they’re different from previous pinning habits? Probably the most rewarding section of Pinterest Analytics is the one showing the audience stats. In order to enjoy it, go to the top of Analytics and click on “Your audience”. Make the best out of this part and discover more about the your fans. The more you know about your company’s followers, the better a service you’ll be empowered to provide to them. Engaged Audience – These are users who liked, clicked on, or repinned your Pins (at least once). These two groups are equally important for your business. The first, the passive group, took a look at your Pins, but didn’t do anything. Focus on returning visitors – how could you inspire them to take action? For the second, engaged group, think of the ways to deepen those connections and draw even more engagement! One more bit of data that might be useful for your business growth on Pinterest is a demographics section. Explore it and see where your fans are from, which gender and age dominates your audience. Pull the information out and it will help you structure the content more efficiently, so it directly “speaks” to your future customers. Should you tackle the interests as well? Marvelous question! Of course, it is impossible to accurately understand the people connected to the business Pinterest account you’re running, unless you analyze their interests. What does your audience (both Viewers and Engaged fans) like? The most popular categories – what are they, what kind of content is regularly pinned in those categories? Your business fits into at least one of their interests – take a look at the Boards, how do people organize your content? What businesses are connected to relevant interests and what could you learn from them? If your audiences engages with these brands as well, follow their interests and aim to create an even better content. Not much can be realized by merely looking at the Pinterest account. In order to fully understand the performance of this simple, yet challenging platform, you’ll have to make friends with the Analytics Dashboard. In there, you can learn what type of content resonates with your audience. Knowing this will bring you closer to potential customers or clients. Sign up to Amplifr and connect your Pinterest profile for thoughtful analytics. At the end, take note that the number of Pinterest followers is not the most important indicator of success on this social media platform. In fact, the engagement proved to be a significant factor, enabling you to build a close-knit community around your business and attract more customers in the future. Some of the social media giants, such as Facebook, Twitter and Pinterest, are proud to offer their own, internal comprehensive analytics. But, this is not the case with Instagram and Tumblr. Instagram does have its own Analytics/Insights feature, available to business profiles. The truth is, only a rather basic data could be found in there. Things are similar with Tumblr, forcing the majority of marketers turn to Google Analytics for help them monitor their blogs on a deeper level. Therefore, we need to get a bit creative when it comes to analyzing these beauties. An overview of your performance on Instagram or Tumblr could benefit you in many ways. Once the clear insight into performance is gained, it becomes easier to run a growth-boosting strategy. Both of these social media platforms are challenging in their own way. On Instagram, a mainly visual site, it might be difficult to track the reach and overall performance of posts. And on Tumblr, with the variety of content types available, where engagement and communication matter the most, running a marketing strategy often feels like running in a hamster wheel. What might seem as a successful venture, might not return desired results at the end. As a business representative, the results are what you seek for, not mere count of likes and followers. So, without further ado, let’s reveal a couple of (free) ways you can monitor and analyze your Insta and then, your Tumblr data! If you’ve ever searched for “Instagram analytics” on Google, a plethora of free tools surely appeared, promising results in exquisite details. Could you test them all? Surely, you could, but that doesn’t mean you should. We know very well that testing different tools can be a huge time-eater. On one side, you’re aware that your business Instagram needs to be checked, but on the other, there’s not much time available for all the tasks – content creation, scheduling, engaging with your audience. Still, you’re aware that certain refining of the marketing strategy is needed once in awhile. Conversions: the desired result of every social media marketing strategy (and marketing efforts in general) is a growing conversion rate; top-performing posts are not necessarily the most-converting ones, so paying attention to the content that actually converts will strengthen your strategy and bring desired results (a.k.a. sales). How to successfully analyze your Instagram presence? Speaking of analytics tools themselves, our warm recommendation for Instagram would be a symbiosis of Insta’s in-built data and advanced Amplifr features. This way, you’ll gain both the insightful and result-encouraging information. Lastly, do not forget about the driving force behind every blooming social strategy – the engagement! Take time to analyze the comments in particular, as it is easy to leave a like, but commenting requires your follower’s effort, while showing deeper interest. Great job, now that you’ve tapped into the fundamental Instagram data, you can take a step forward with Amplifr and track the purchases made on your website, but the ones driven with your Insta posts. Simply, Instagram posts are powerful gates into straightforward sales funnels. Mostly visual and clearly targeted by hashtags, content on Insta has an immense promotional value. Amplifr steps into the game when you want to track a specific post that led to an actual purchase. In simplest of words, doing so helps you improve on and finally, monetize your Instagram marketing efforts. Sign up to Amplifr and connect your Instagram profiles for posting reminders and reports. 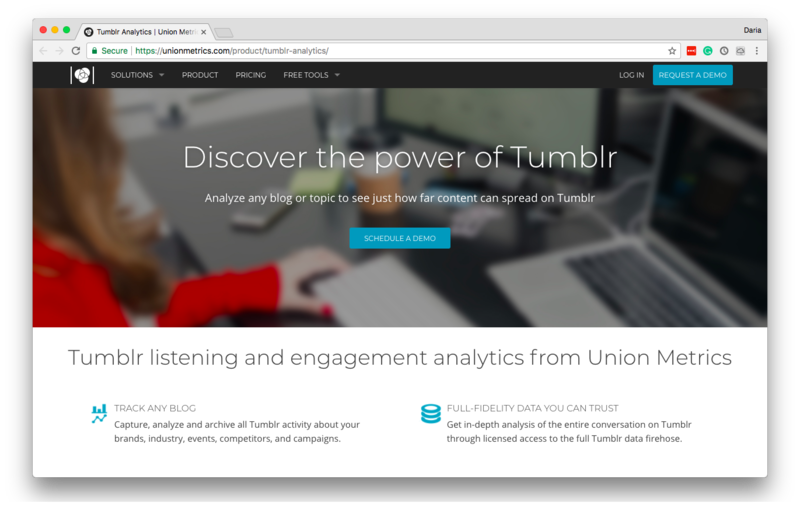 Tumblr and Union Metrics first announced the launch of Tumblr Analytics in 2013, but is this option also free and in-built like the others we covered in this guide? Unfortunately, no, it is not. Whilst the partnership of these two companies offers a comprehensive, in-depth Tumblr analytics, it also requires a rather deep wallet. Therefore, Google Analytics proved to be a solid solution for monitoring and analyzing your Tumblr activity. But, hold a sigh of relief a bit, there are certain complication here as well. It turns out that Tumblr data cannot be fully monitored with Google Analytics. The metrics such as engagement, as an example, are simply not as visible in GA as they could be. After all, Tumblr blog is a peculiar kind of blog. Not a regular type of website, but a blog integrated into the Tumblr social platform. Using Union Metrics and their Tumblr analytics, you can monitor some parts of your blogging activities and analyze them as well. The reason why Tumblr’s popularity has recently skyrocketed lies in this platform’s growth potential. Tumblr is particularly important for businesses, as you can raise the visibility of well-structured content, while expanding your community at the same time. For these reasons mainly, this platform is worth the investment, both of your time and little bit of effort. Observe all of your recent Tumblr notifications. Truth to say, Activity is not the most feature-rich tool in the world. If used regularly, you could gain basic insights about your followers and which posts resonate with them the most. If long-term metrics is what you need (and our guess is that you do), consider using Union Metrics or the cheaper and more convenient Amplifr analytics. Keep in mind that the basic Tumblr tool we’ve mentioned stores and displays the data only for a month. Google Analytics is free to use, but some of the Tumblr data might not appear in there (Google sees it as any other blog, not as a social network that it truly is). Either way, Tumblr is one of the most exciting social-blogging websites at the moment. While it is impossible to state which analytics tool is the best for this peculiar platform, it is possible to pinpoint the not-so-expensive, yet immensely helpful solution. So, if you choose to include Amplifr in your Tumblr marketing arsenal, it will help you schedule, analyze and optimize the marketing strategy in an effective way. Sign up to Amplifr and connect your Tumblr pages to analyze the engagement and alter content schedules accordingly. Most importantly, Amplifr’s features can bring you closer to your community and remember – community is the heart and soul (and flesh and bones) of Tumblr. Let’s start with a burning question. Why would you need a social media marketing report anyway? In the simplest of words, if you want to go beyond the basic analytic steps, you’ll need a more advanced data insights. A solid report on your business goals, achievements and status on social media, will help you improve the overall performance. But, how? The secret of successful reporting lies in comparison. That is right, by both comparing how your channels performed before versus how it performs now and also, how your social marketing is positioned against the competitors. A while ago, at the very beginning of this guide, we mentioned the vital steps of an analytics process itself. The last and probably, the most important one is “recognizing the patterns which emerge out of data”. And certainly, that part of the process can only be completed through a detailed, clearly outlined report. Out of the need to make social media reporting as convenient and effective as possible, various analytics solutions appeared, including Amplifr. The main reason why social media reports are the prevalent cause of migraines in marketers is – quality reporting often requires significant investments (mostly financial ones). The question appears: is it possible to entirely avoid the tools and make a hand-made report? How difficult could it be to gather the data and present it in a readable form? By all means, if you have time to waste, the manual option is always there. All joking aside, some marketing professionals prefer to go through this process manually. In a way, doing things the “old fashioned way” might shed a light to some usually skipped over data. Collect the data and begin the analysis. In Excel itself, you can build a detailed, yet straightforward social media report. For the sake of utmost clarity, use data selections, different summary tables, as well as various graphics for the presentation. Get creative and include your thoughts, recommendations and conclusions based on gathered social media data. With social media reporting, the end goal is to meaningfully organize the once raw information, so you could present it to your clients, co-workers or partners. What benefit do they have from a bunch of numbers, collected from already confusing social networks? That is true, none. This is where reports come to rescue. Accordingly, the organization of data needs to be immaculate. Show no mercy to unnecessary information, cut the data whenever needed and make sure to throw a spotlight on game-changing numbers. No matter how much you like it (no judging if you do), the outlined method of manual reporting is awfully time-consuming. First, you need to download the data from each and every social media channel you’re managing, then to convert all that data and collect it on one place and finally, understand the patterns and reorganize everything so it tells a story. One already gets tired from reading that sentence, let alone going through those steps again and again! Even better, what if a tool such as this one, could create a full report in Excel, using that unique information? Would you use it? Or maybe you prefer the step-by-step, time-devouring manual reporting. As a social media management, scheduling, analytics and reporting tool, Amplifr does it all for you. Imagine getting a complete report, based on data from your own channels, armed with summary tables and a dashboard you are free to re-organize if needed. We agree, it sounds wonderful. You might be thinking: alright, so Amplifr gathers all my data automatically, does its calculations and shoots out the Excel report. Is it enough? What do I exactly get from this? Audience review – is your fan base growing or shrinking? The entire serving of data is accompanied by a graph dashboard, because if your report doesn’t look nice, the chances are slim it will be examined with patience. So yes, you’ll have everything you need to conduct a outstanding social media reporting session, either for your clients or coworkers to enjoy. Anyone wanting to grow a business with social media, should know the ins and outs of analytics. Why? One of the main uses of social media analytics is to support and improve on the social marketing strategy. The process of analytics involves: the discovery and a professional interpretation of raw information; a meaningful grouping of data; an understanding of patterns which emerge out of grouped data. Some of the business goals you’ll want to achieve through social media can be increasing revenue, gathering the feedback, reducing the cost of customer service, and raising the awareness on topics you and your company believe in. Define your KPIs. KPIs are the metrics which are crucial to the strategy’s success (usually, conversion rate, engagement levels or click-through rate). When analyzing top-performing posts on Facebook, think about their timing, format, and tone of voice. To improve your Twitter performance, monitor the tweets that mention your Twitter handle and how much impressions they’ve received, get connected with the influencers in your industry, and find the best-performing tweets to mold your strategy according to those wins. While analyzing Pinterest, besides the number of pinned and repinned posts, you should identify your audience, their interests, and if your business fits into at least one of their interests – take a look at their Boards! Our warm recommendation for Instagram analytics would be a blend of Insta’s in-built data and advanced Amplifr features. When starting the Tumblr analytical process, begin with the audience, as having an engaged community is a must on this platform. With social media reporting, the end goal is to meaningfully organize the once raw information, so you could present it to your clients, co-workers or partners. Amplifr offers all the information you need in order to build for a solid, clear, nice-looking report. How to install and use Google Tag Manager to build analytics suite for your SaaS.